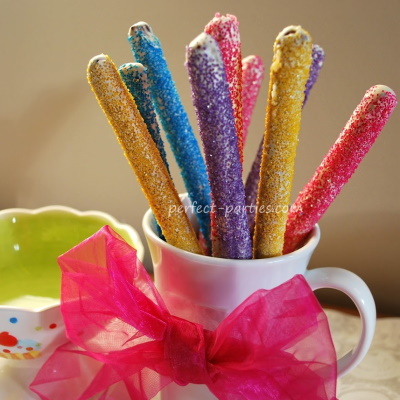 Cute pretzels make great party favors or treats. Just select your choice of sprinkles and dip pretzels in white or dark chocolate. Tie 3 in a clear party bag to show off the treats! 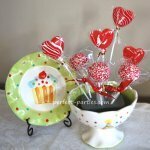 We have given this as teacher gifts too for special holidays like Christmas and Valentines Day. I prefer using a Stainless Steel Double Boiler Pot for Melting Chocolate which I found on Amazon. Just fill the pot with chocolate and place the double boiler on a small pot of boiling water. Chocolate should be warm not hot. Chocolate scorches very easily and will taste burnt if heated too long. Microwave 60 seconds on 50% power, stir well, and repeat 30 seconds at 50% power until melted. You may need to adjust according to your microwave. Brush chocolate evenly with silicone pastry brush. Tap excess off gently while rotating for smoothest coat. Another method is if you have a tall skinny glass, fill with chocolate and dip pretzel into the glass. For easiest way to conserve sprinkles, put a piece of foil creased in the middle into a rectangular container. Sprinkle over the foil. Simply lift foil and pour excess back into container to sprinkle next one. Do not let chocolate drip into the sprinkles. Let dry on waxed or parchment paper. Let set and harden in refrigerator for 30 min. 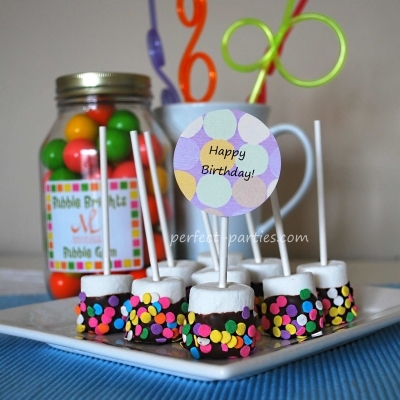 Chocolate Dipped in Regular Chocolate and Colorful Sprinkles added. 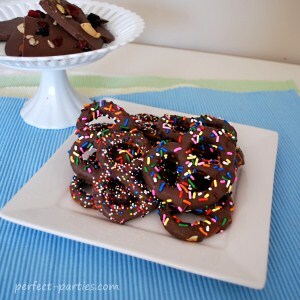 We found the easiest way to dip was using small tongs and gently lowering into chocolate, lifting, let excess drip and turning the pretzel over. While still holding with the tongs, add sprinkles the sprinkles over a small bowl or cake pan to catch or conserve the extra sprinkles. Extra chocolate? Make some easy chocolate bark. Pour onto parchment paper for best results and add nuts, dried fruit, or mini m and m's.